The par 5 17th is a gem of a hole you are sure not to forget. While the water in front of the tee is easily cleared by most players, it does help frame a tight tee shot which must find a narrow fairway between stands of old-growth pines. 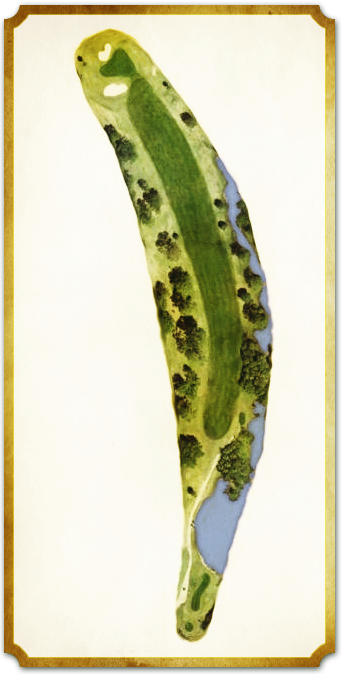 Long hitters can tempt fate by cutting the corner over the edge of the left trees, and making the carry will reward their bravery by rolling out an extra 10 yards down the far side of the ridge, leaving only a middle iron to this undulating green. A layup should favor the right side for a clear look at the pin. Don't short-side yourself here, or you will need to be a wizard with the wedge to get up and down.